The house has an area of ? 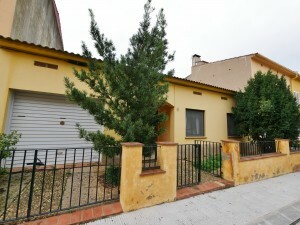 ?128,92 m2, occupying the ground floor 107,55 m2 and the garage 21 m2. The ground floor is distributed in porch, entrance, hall, hall-distributor, kitchen, living room, 1 bathroom, laundry room and 3 double bedrooms with fitted wardrobes,. It has a garage of 21 m2 and patio. The access areas and the patio together occupy an area of ? ?147.05 m2. It has ceramic and parquet floors, wooden closures and natural gas heating. HOUSE WITH MANY POSSIBILITIES AND GOOD SITUATION!